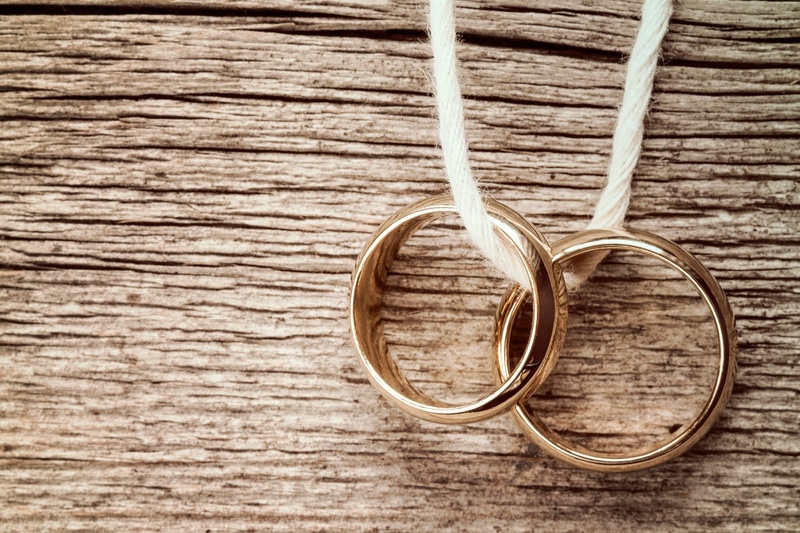 If you’ve been paying attention to wedding bands these days, then there’s no doubt you’ve noticed that, more and more, they’re starting to appear in different forms. No longer are men satisfied or content with the classic silver, gold, or platinum bands. They are seeking rings made of non-traditional metals, with designs and styles that buck the plain or lightly decorated bands of the past. Unique men’s wedding bandsare extremely popular, right now, with modern machining and manufacturing methods making new kinds of designs and materials possible every day. Whether you’re a vintage or timeless soul looking for a classic and elegant wedding band, a trendsetter looking for what’s on the cutting edge of men’s jewelry, or a practical working man looking for something economical and hard-wearing, like men’s tungsten wedding bands, there’s something out there for you. This guide will be a great introduction and overview to the world of men’s wedding bands and will help you decide. No matter what material you make it out of, the classic band style of wedding ring will always be in fashion. 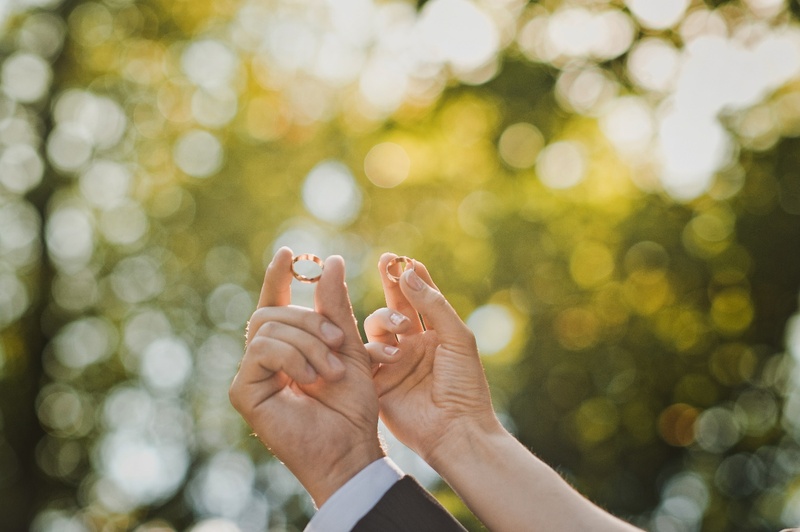 While it may not be as flashy or ornate as other types of rings, you can rest assured that it will always look just as good on you in the future as it does today. 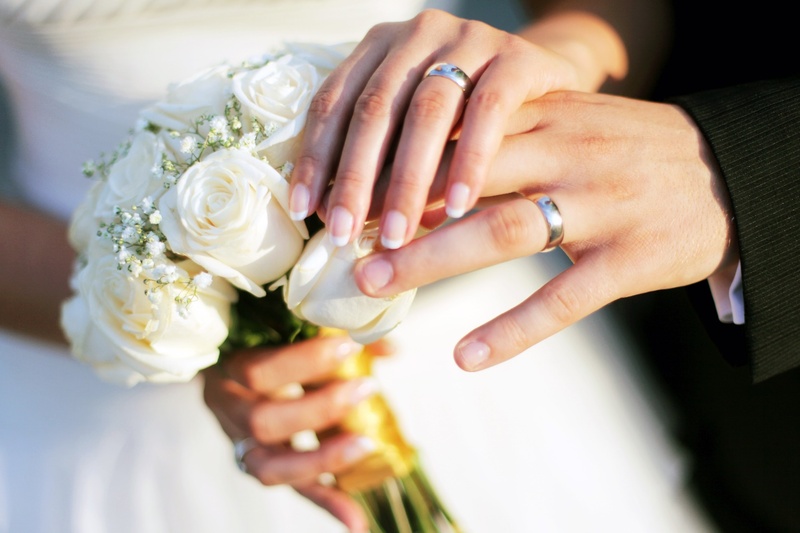 Another benefit of a relatively plain ring is that it will be easy to find one that fits into your budget. 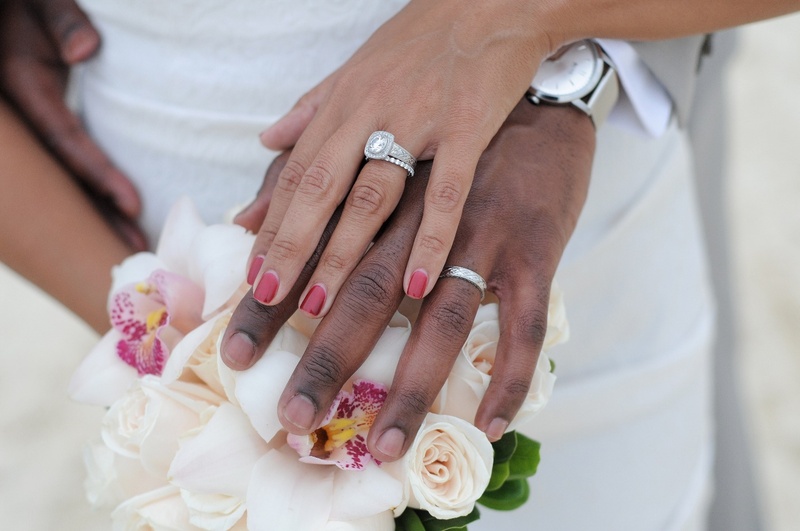 A classic wedding band will look equally good no matter what material it’s made from. This makes it a great choice for young grooms, as it allows them to get a great-looking ring even when it’s made from inexpensive materials. As platinum is the most precious metal there is, a wedding ring made from platinum is as much of a statement as it is a symbol of matrimony. Due to platinum being a metal rather than a style, it can be formed into any form of ring. The fact that the ring is constructed from platinum will elevate any design, conventional or unconventional, to greater heights, owing to the flash and wow-factor of the precious, lustrous white metal. For the look of platinum, but without the price tag, look into palladium. While a bit harder to find, palladium is a metal incredibly similar in appearance to platinum. In fact, palladium is a byproduct of platinum mining. Textured or distressed finishes for rings are very popular with modern grooms. A faceted or roughed-up finish creates visual interestwhile still not looking too far removed from a traditional band. As gold is quite soft and malleable, it might not be the best fit for a ring with small, fine detailing like a delicate wood grain or pebbled surface, as the softness of gold might eventually mash in some of these features and distort them. A more resilient metal, like tungsten carbide, cobalt, silver, or, if your budget allows for it, platinum, might be a better idea. 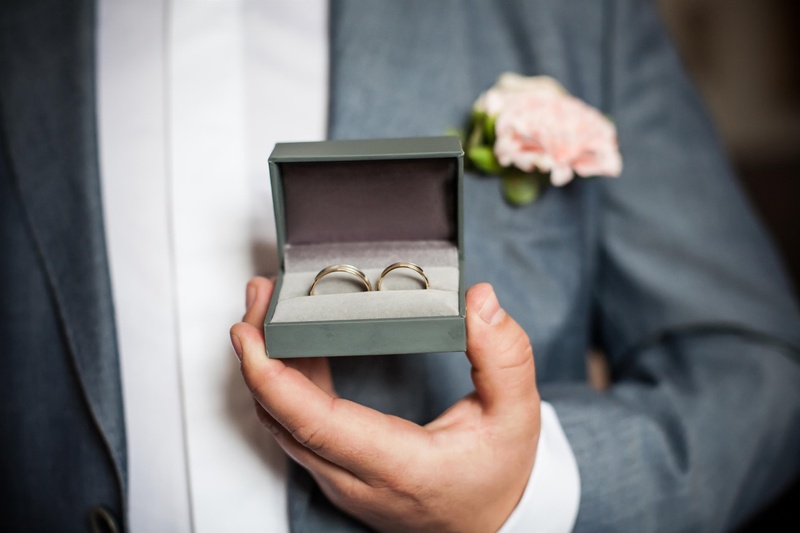 More and more, grooms are choosing rings made of tungsten carbide for their wedding bands, and, once you’ve learned a bit about them, it’s easy to see why. Tungsten, also known as wolfram, is an incredibly tough and hard wearing metal. Furthermore, it’s hypoallergenic, meaning almost anyone can wear it with no difficulty or problems. As a resilient metal, it’s virtually impervious to chipping, cracking, or deforming. Previously, tungsten rings were limited in design, due to the extreme hardness of the metal, making it impossible to work with. As modern manufacturing and production techniques improved, however, refinements were made, and now tungsten carbide rings are able to be produced in just about any style you can imagine. While the solitaire gemstone mounted in prongs, or the Tiffany setting, can’t be replicated due to tungsten’s lack of ductility, precious stones can certainly be mounted through tension or inset crafting. Tungsten carbide rings are also available in a variety of finishes, from light-colored finishes that mimic the look of white gold or platinum to dark or black finishes that give it a sleek, modern appearance. Also common are rings with bands of contrasting finishes or even with inlays of entirely different materials, such as a precious metal like gold or silver, or more natural materials like wood or crushed stone. 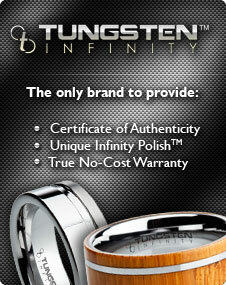 Because tungsten carbide is so inexpensive, you’ll find non-traditional rings are far more commonly made out of it. Because jewelers don’t have to commit an expensive, precious metal to the design, they’re more willing to experiment with modern cutting-edge designs, giving you far more options, without needing a custom order, than those of rings made from gold or platinum. One drawback to tungsten carbide rings is that, due to their impressive durability and hardness, they cannot be resized. Fortunately, many reputable dealers will offer replacements, either for free or for a nominal fee, and for either a fixed number of replacements or a lifetime deal. Cobalt is another alternative metal that is very popular for wedding rings. With a silvery, lustrous sheen, cobalt gives you a look very similar to that of platinum or high-karat white gold, but without the considerable price tag of the precious metal. Since men are more likely to lose their wedding rings—due to taking them off and putting them on more often while participating in activities like work, exercising at the gym, performing yard work and other manual labor, or simply going to bed—a less expensive ring can be a good idea. Most everyone is familiar with titanium and probably aware of its vaunted strength and durability. Titanium is a popular alternative metal for wedding rings, and for good reason. Just the name titanium conjures up all sorts of fantastical images of superheroes and space age technology. Most any man would be excited to show off a ring made out of titanium, and, with the price and availability of pretty much any design and a variety of finishes, finding the one you want isn’t terribly hard, either. Your father’s wedding band was probably just a plain gold band, maybe with a brushed satin finish and possibly a diamond or two if he was fancy. Today, your options aren’t nearly so limited. Designs in the band of your wedding ring are very popular at the moment. From Celtic knot work to Nordic runes and patterns, a ring that has an interesting or meaningful pattern will certainly catch more eyes than a simple band. 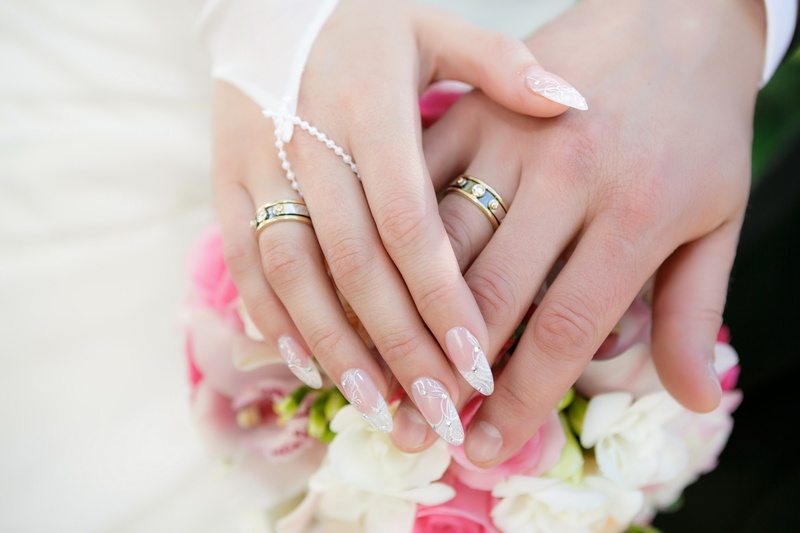 While there’s no lack of options if you want a gold ring or a white-metal ring, rings finished with a dark coating are very popular and trendy. A darker ring can show off a rebellious or fashion-forward sideand can be paired with black gemstones like jet, black sapphires, black diamonds, or black spinels. It’s even possible to get an entire ring constructed out of one solid piece of lab-grown black diamond. Just like the new iPhone, rose gold is very popular for rings. This alloy of copper and gold has a beautiful reddish hue and looks great on anyone. Available in a variety of purities of gold, rose gold rings are a great way to have a fresh take on a classic look. This is perfect for guys who have a vintage style but want to take a more modern approach, so it doesn’t look like they stepped out of a history book. For more information about today’s popular wedding bands, including tungsten carbide, don’t hesitate to check out the selection we have to offer at Men’s Tungsten Online.